Chinook salmon is a predatory fish that feeds on alewives, below. 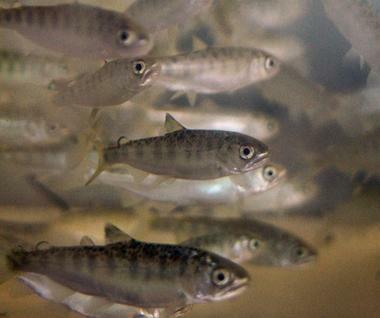 Great Lakes natural resource managers and anglers have come up with a plan to reduce salmon stocking in Lake Michigan by 50 percent in order to avoid depleting the alewives population, which is at an all-time low. File photo: MLive. When the Lake Michigan Chinook salmon fishery crashed in 1988 because of bacterial kidney disease brought on by the stress of overstocking, among other things, anglers and charter captains were upset the state wasn’t going to solve the problem by simply putting more fish in the lake. Today, however, they have a notably different attitude. Anglers and state fish managers are talking more about sustainability. Better to have a steady and predictable supply of fish. Boom-and-bust cycles are costly to anglers, lakeshore communities and the state. What is refreshingly different is that anglers, by and large, embrace the multi-state plan to cut Chinook salmon stocking in Lake Michigan by 50 percent in 2013. That plan is the result of more than a year of discussions between anglers and state natural resource managers around the lake. Twenty years ago, they would have screamed bloody murder. The problem, according to state fisheries officials, is that alewives in Lake Michigan are at an all-time low. Chinook salmon eat only alewives. Without them, Chinooks are gone. Too many predators, they say, will crash the system because there isn’t enough to eat. Lake Michigan states now stock approximately 3.3 million hatchery Chinooks in the lake. Northern Michigan streams also contribute an increasing number of naturally reproduced Chinooks. Those wild fish now make up about 56 percent of the catch, according to state research. Those fish, however, create added pressure on the limited forage base of alewives. Lake Michigan fish managers hope to create a predator-prey balance that allows for steadiness in future years. “The path is laid out for six years,” said Jay Wesley, the Michigan Department of Natural Resources fisheries biologist, who has spearheaded Michigan’s part of the multi-state Chinook stocking assessment. “We can make year-to-year changes if we have to, but we won’t see the effect on prey (alewives) from the change in predator (salmon) numbers for a couple of years. Michigan stocks 1.68 million hatchery-raised Chinooks each year. Starting next year, it will plant only 559,000 in Lake Michigan, 1.1 million fewer fish, a 66.9 percent reduction. Michigan will take the lion’s share of cuts because of its large contribution of wild salmon from northern streams. Those fish swim all over the lake before they return to spawn. They are caught off any port, Wesley said. Wisconsin will plant only 724,000 Chinooks, a 37.8 percent reduction from the 1.16 million it stocks now. Illinois, which cut stocking once already, will plant only 230,000, an 8 percent reduction from 250,000 stocked now. Indiana will cut 11.1 percent, from 225,000 to 200,000 fish. When the ’80s crash came, many felt the state owed them something. Anglers aspired to be commercial charter captains; teachers thought they would supplement their summer income doing the same. Some just purchased a boat and planned to live out their days fishing for 30-pounders. “Just plant more,” they said when the fishery collapsed. What largely is sought today is sensible, practical, scientific management to the extent possible. Back then, Chinook salmon largely were a put-and-take fishery. We grew them, stocked them, caught them and planted more. Today, in places, they are becoming established as self-sustaining fishery. That has implications for reducing the number of angler dollars spent on hatchery operations and planting efforts. And so, anglers and charter captains are talking differently. “We’re not concerned about the 50 percent. We are concerned about how it will be applied,” said Jim Fenner, past president for the Ludington Charter Boat Association. Fenner said salmon fishing was “over the top” this summer, one of the best years he had seen since the 1970s. But he and others share a concern about where Michigan’s cuts will come. Rivers that are stocked with Chinooks have an active fall fishery as the mature silver predators congregate near shore off river mouths before migrating upstream to spawn and die. The priorities are to maintain broodstock on the Little Manistee River, where the state collects its Chinook salmon eggs. Northern Lower Peninsula ports will take a bigger hit than southern Lower Peninsula ports, but Upper Peninsula ports won’t be cut as much. “Whether it’s a 50 percent or 60 percent cut, they will all see a pretty high reduction,” Wesley said. “We’re comfortable with the plan to cut stocking by 50 percent,” said Dennis Eade, the executive director for the Michigan Steelhead and Salmon Fisherman’s Association. “We wanted a two-year hiatus on stocking. I wanted them to plant zero fish for two years. We support the plan wholeheartedly. Said simply: That’s as different from the past as it could be. This entry was posted in Uncategorized and tagged Chinook Salmon, DNR, Fishing, Hatcheries, Lake Michigan, Salmon, Wild Salmon. Bookmark the permalink.